1. Shred the cheese using a box grater and set it aside to warm to room temperature. Bring a 6-qt pot of water to a boil. Add the macaroni and follow the directions on the package for al dente. 2. While the macaroni is cooking, prepare the cheese sauce: In a 3-qt saucepan, combine 2 cups of the milk with the soy sauce, onion powder, paprika, salt, pepper, and hot sauce. Place over medium heat and cook until the mixture comes to a gentle simmer. In a small bowl or cup, mix the cornstarch with the remaining 1/4 cup milk, Add the cornstarch mixture to the sauce and stir to combine. Bring to a boil, then simmer 2 to 3 minutes, stirring occasionally. The mixture should thicken slightly. 3. Remove the saucepan from the heat and add the shredded cheese. Continue stirring until the cheese is completely melted and no lumps remain. Add the butter to the cheese sauce and stir until it is completely melted and combined. Drain the macaroni and return it to the 6-qt pot. 4. 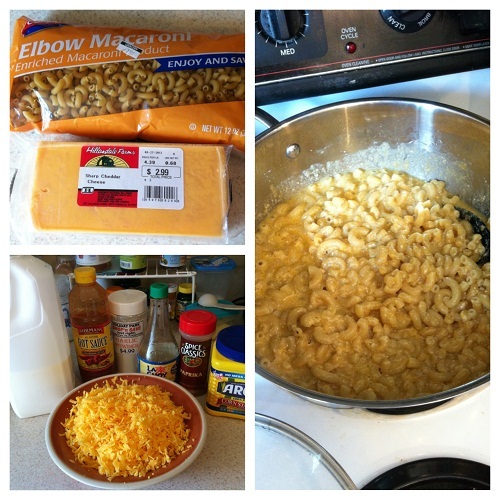 Pour the cheese sauce over the cooked macaroni and stir until everything is coated. Cover the pot with a tight-fitting lid and allow the macaroni and cheese to sit for 5 to 10 minutes, to let the sauce thicken before serving.